Your bike is a workhorse, waiting to take you and your stuff where it needs to go. 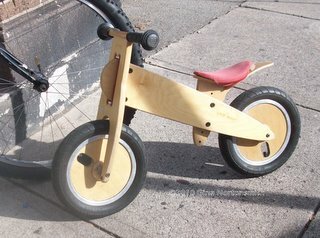 Judging from letters to the editor in our local newspaper, many people think of a bicycle as just a play thing, a toy used to get a exercise on the weekends. Go whole hog and use a trailer with your Extracycle! That’s true for some, but for a growing number of people,the bike is becoming a method of regular transportation. Which means that people have to figure out how to take their stuff with them. Groceries, school bags, lunch, change of clothing, laptop – they all need to come along. Here are some ways to enjoy the scenery and bring your stuff. The easiest way to bring your belongings is just put them in a backpack and wear it on your back just as if you were walking. This isn’t the method I prefer, as it requires balancing a heavy bag and making my arms brace on the handlebars to hold the load up. Let the breeze cool you on a hot day. In the summer having a bag on my back results in my getting even more sweaty and hot because the bag blocks the breeze. What I prefer is having the bike carry the load so my body can concentrate on moving everything forward. Stopping and starting is much easier without a bag on my bag because I don’t have to worry about its weight throwing off my balance as I move. If you’re going to have the bike do the carrying, then you need to have a rack on the bike. You can find them at any bike store, the most common being the rear rack which fits just over the wheel, and screws into the frame at the hub and near the seat post. When you put it on, make sure the top surface is level for better balancing. Once the rack is on, the methods of carrying are endless. 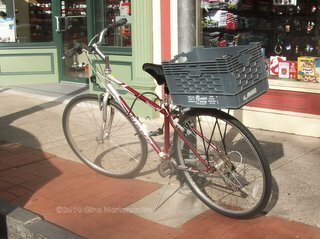 With a rack, you could just strap your things to the top using a bungee cord or straps. I use straps to avoid bouncing off bungee cords and flying hooks. Next easiest is using the milk crate. These are easy to find or buy. 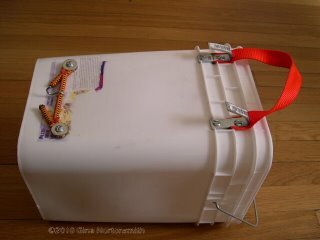 Use several thick cable or zip ties to hold it onto the top of the rack and it’s open top can carry whatever you can fit in there. Just plop your things in and take off. 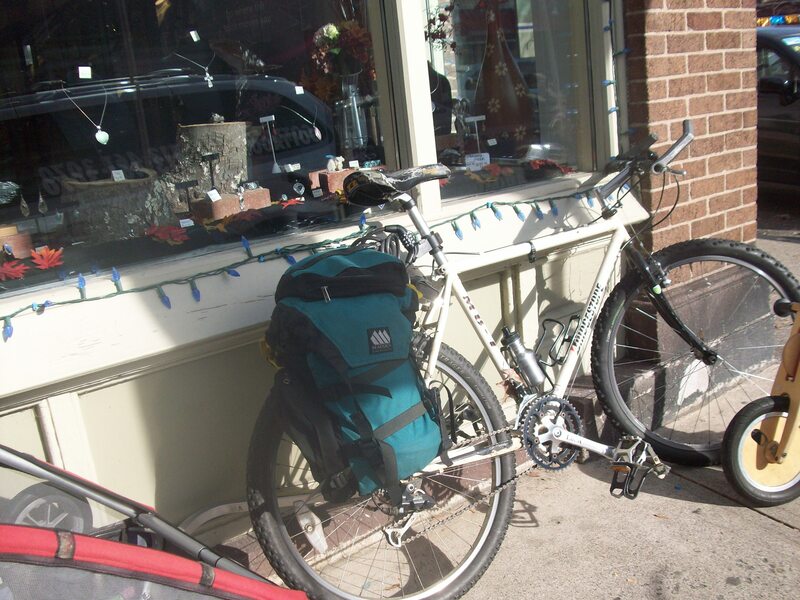 Many people opt for a pannier, or bag, which is held on the rack by hooks. These also can be purchased at bike stores. Some are water resistant, and others completely waterproof. If you go this route, get the best bag you can afford, with thick material like cordura, or waxed cotton duck cloth, and sturdy hooks. Look for the robustness you would expect in any outdoor gear. Another do-it-yourself way to carry things is the cat litter bucket. If you don’t have a cat, you may be able to find empty buckets a the trash transfer station. I’ve also gotten from cat-loving friends. I use these containers more than any other. One thing I love about my bike buckets is they don’t leak, and they can carry an awful lot. I can get a gallon of milk in them and still have room for lots more. With their lids, I always have a seat and a table! Here are some close-ups of the construction of my buckets. The side that attaches to the rack. Inside view showing washer supports. I used a nail or awl heated over a candle to push holes through the plastic for the screws. Wide washers are used to support plastic bucket at the screws on the inside and outside, spreading the tension load. 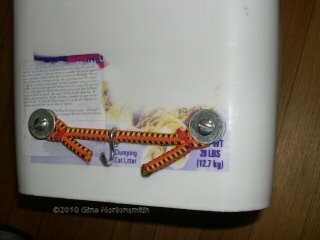 Bungee cord and S-hook attachment for rack bottom. I purchased thick bungee cording from an outdoor store by the yard, and cut it to length, making sure the tension would pull the bucket enough to keep the hooks at the top from bouncing up and off of the rack. 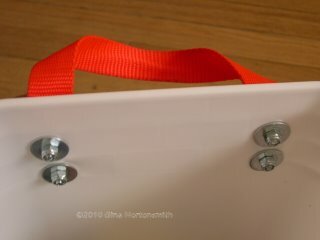 An S-hook clasped around the bungee cord hooks onto the bottom of the rack. 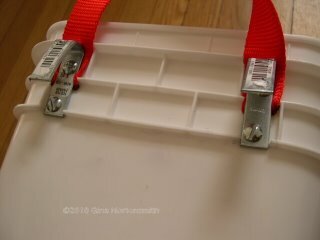 Washers help keep the bungee from slipping off of the screws, and heavy duty cable ties hold the bungee in place around the screws. Bent angle brackets and a hand strap for easy mounting on the rack. The top of the bucket is held on the rack by angle brackets pounded into a U-shape using a hammer and a stick inside to hold the shape. I cut notches in the plastic for in the top to make room for the angle brackets. The strap is for lifting the bucket on an off of the rack, and for carrying. I did leave the metal handle on the bucket, but make sure to put it on the rack side of the bucket to cut down on rattling racket. Finally, you’ll notice that I have lots of reflective tape, piping and reflectors on my bags and buckets. I get them at the auto supply shop and the fabric store. Even when I am not carrying anything, I use the buckets on the bike at night to make me more visible to car drivers. They are wide, white, and help drivers know where I am and how much room I take up. 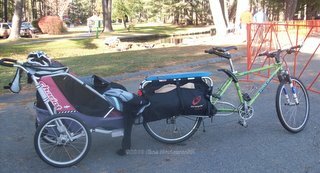 I use my bags an buckets for getting groceries, books at the library, bringing documents to meetings, snacks and jackets for trips to the park, and my favorite, taking bike trips with my sons. They truely move the bike from toy to workhorse, helping me get done what I need to do. I highly recommend using these ways of integrating your bike into your regular transportation methods. I’d love to hear from you about how you carry your stuff on your bike, and what you carry. Need help figuring out just how to get started? Drop me a line in the comments – I’m glad to help. This entry was posted in Make It Yourself, Tips, Touring, Travel and tagged Bicycle, Bike, Biking, Cycling, Touring, Transportation, Travel. Bookmark the permalink. I just have to make one comment. An otherwise healthy adult who goes to a store less than a mile away in his/her car should not be just looked down on, but considered a traitor to this nation for necessarily using petroleum for a trip they could have done on a bicycle. The League of American Wheelman lobbied for good roads. Then the people moving around at high speeds on their 14 ton toys (cars) are making those roads unsafe to ride on. It is not patriotic to use a car instead of a bicycle, and so cars should be taxed as the frivolous luxuries that they are unless a person can prove they he needs the vehicle to get to work. I liked all the ideas presented here, go forward with them. The way this country is going the only form of transportation many of us will be able to afford is the bicycle anyway. I agree that the use of oil is a national policy issue which deserves more attention in the general population. Isn’t it frustrating when people drive by while you are biking and harass you? As if you are doing something traitorous by being on the road without using oil? Here you are, not polluting, not contributing to global warming, not getting on the highway in front of them, but still they find the need to shout, honk, or drive way too close. Arrgh. I like the utilitarian aspects of cycling as it addresses some of the problems non-cyclists point out as obstacles to cycling. For me, there is truly beauty found in usefulness. 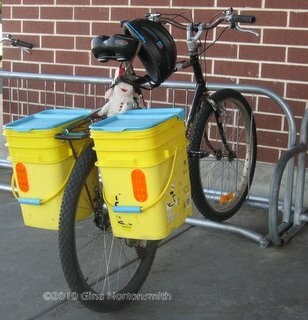 I’m a fan of the idea of the cat litter bucket panniers. I’ve not tried them, I roll with the collapsible metal wire baskets. I like them because they take up such less room when I am not using them. The waterproof aspect of the bucket system looks appealing, as does always having a seat, and increasing visibility. I think it’s very cool you took each of your sons on a bike tour. Thanks for commenting The Midwest Bicycle Commuter blog. Now that I know you might be out there reading it, I’ll try to improve the writing where I can. All along, I’d not had any followers or anyone leaving comments so it became easy for me to become lazy and let the quality of my writing suffer, along with the reader. We as aspiring writers need to support each others’ efforts. I like your blog. My son rides to school and uses the Wald collapsible baskets, also. They fit his school bags and his sax case, which does not fit in a bucket. They are really terrific products. The buckets work for me most of the time, and only cost about $13 per pair to create – not including the cost of the cat litter! Putting on so much reflective material really boosts their usefulness to me. I feel quite lucky that my sons want to go on bike tours with me each summer. We get to know each other in new ways, and the memories are treasures! Good luck with your blog – the readers are there. You’re doing good work.